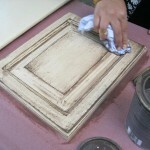 Here’s the entire process of putting glaze onto existing wood kitchen cabinet doors. In recent years real wood cupboards have dominated the market. The process of glazing cabinet doors has become a remodeling favorite for existing kitchen cabinets as well as new construction projects. Prior to the mid to darker colored wood doors we are now seeing as the dominant trend, consumers were using lighter tan tones and pickling the finish with white stains. Now the trend has taken a turn in a totally different direction. Many high-in homes are decorated with medium colored doors having a darker brown accent in the routed details of the wood. This dark pin strip line is generally made by applying Umber wood glazing stain. So, how is it that these dark stain accents can be added to kitchen cabinet doors? Important note: Always apply a small amount of the clear coat finish that you purchased on the back of one of the doors to test the compatibility of the existing finish with the one you purchased for the project. If the two are not compatible, you will have to go shopping again. 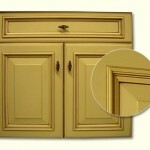 Most cupboard door manufactures use lacquer finishes. The polyurethane should just about adhere to any surface, but the clear lacquer will not. Lacquer is a solvent that cuts through various types of paint finishes. Before you begin applying the glaze to the cupboard doors, wash them with a mild mixture of Dawn dish-washing liquid and water. This will cut through any grease build-up that may be on them. If you OMIT this process you will be extremely sorry that you did so. When you are ready to apply the clear top-coat, be sure to spray the lacquer or polyurethane in a well-ventilated-area. Both of these products have a very strong Oder and are not good for your health when inhaled. If you will be spraying a lot of kitchen cabinet doors at once, you should invest in a respirator mask. I don’t mean a dust mask. I’m talking about the industrial ones that have filters which protect your lungs from inhaling the fumes through your mouth and your nose. These are not cheep either, but well worth the investment. Start by putting a little of the dark umber glaze on the lid of the can after you have stirred the liquid. Dip the corner edge of the foam brush in the stain. 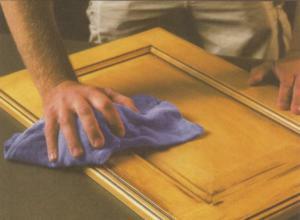 Apply the liquid to the inside edges of the wood door’s raised panel. Wipe the glazing stain completely off of all areas that do not need the darker color. The pin striping should be done in small sections. 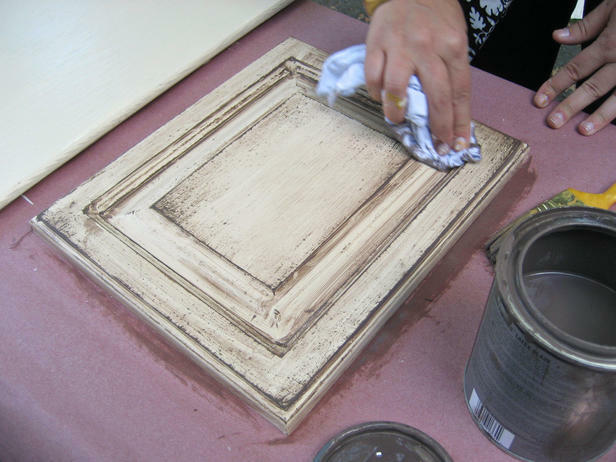 Do the outside edges and wipe the excess off, then brush the glaze on the inside detailed parts of the kitchen cabinet door and wipe it off again. Allow the stain to thoroughly dry for the recommend time. Spray one coat of clear finish. You should always spray in one direction then the other when applying one coat. Give the newly remodeled glazed kitchen cabinet doors a second coat of your clear coat finish. That’s all there is to the process outside of removing the doors from the kitchen cabinets and reinstalling them. This method will obviously work for bathroom vanity cupboards as well. 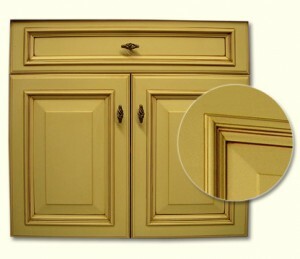 Glazing cabinet doors is a great way to make an old set of raised panel cabinet doors look new again. I glazed my kitchen cabinets today. After I let them dry for 24 hours should I go back and polyurathane them? I’m afraid I wont be able to wipe them if they get dirty without removing some of the paint. Also wouldnt polyuarathaning them make them water proof? I have white thermafoil cabinets and want to glaze them to look antique white like your photo above. Is this possible on the MDF Thermafoil cabinets, and if it is, where could I find “how to instructions”?